Over the last few years, conditions have deteriorated. 10 years ago, postal workers went on strike and won some concessions. One of their main complaints at that time was that they didn't want to carry lots of advertisements to deliver, which they were expected to do on top of their normal loads. Although there were agreements on this topic, 10 years later, many offices demand the workers take this marketing material, carry heavier packages and sell gadgets to supplement their incomes. When Poland decided to enter the European Union, parts of the agreements concerned the „demonopolization” and commercialization of state-owned enterprises such as the Post Office. Private postal operators were to be allowed on the market, who employed people on trash contracts to office cheaper services. The Post Office lost huge contracts such as the courts, which started to use the competitor, In Post. As a result, there was a lot of reorganization and austerity at the Post Office. The competitor's services proved to be tragic and this contract, as well as others, came back to the Post Office. However, the Post Office did nothing to deal with the increase in work, except load the mail carriers with more and more work. Some have to serve regions so large that it is completely impossible to do on foot and they use their own vehicles to help. Most are not able to do everything in an 8-hour day. The weight of the bags they should carry often also exceeds health and safety norms. Although there are plenty of unions at the Post Office, the conditions do not get better. In fact, the main unions tend to sign agreements that make matters worse. The last „raise” which workers received was actually a restructuring of the elements of their salary which resulted in many receiving a couple of hundred zloties less. In fact, the „raise” mostly was a way to avoid paying more when the minimum wage was raised by 150 zloties last year. The main union representing the mail carriers is Solidarity, which has a „social peace” with the current government and works to avoid any mass protests while it is in power. In terms of other postal workers, the main union is the second largest in the country, OPZZ. Workers started massively criticizing the roles of the unions in the management of their misery. A couple of smaller groups of workers started to organize themselves on the local level. Over the past year, their were a number of protests, some being work stoppages or taking days off work. Members of ZSP in the post office started to make contacts, visit people and coordinate meetings and exchange of information. Finally workers were ready to meet at the national level and work out common demands and plan a strategy to fight for them. The first steps were decided: a national series of protests on the same day as a warning and then escalation. As it was, some of the workers were already ready to strike and refused to work on the day of the protest or cut short their hours. The management of the Post Office and Solidarity have been trying, unsuccessfully, to dissaude people from this actions for a while. Solidarity has resorted to malicious and defaming anarchosyndicalist baiting in the internet and radio. There were some bureaucrats from that union that participated in the intimidation campaigns which took place before the protest and during: they instructed their members not to protest and videotaped people during the protests. They were among those who tried to convince workers that the protests were „illegal”, using various arguments. The management did this as well. Among the arguments were that the main representative unions were in a collective dispute with the Post Office that stipulated that there could be no protests. Thus they claimed that the protests were illegal under the law on trade unions. They also invented a number of other lies and in Warsaw, informed the police that protesters planned some attacks. In some cities, people were threatened with disciplanary dismissals if they would protest. In Silesia, some workers managed to record these threats and sent them to the press. Unfortunately, the Post Office already did this, firing K.W. from Silesia, who was very vocal at the protest and who spoke openly in the media. They formally justified the dismissal citing critical posts that he had made on Facebook. For some while, we have run a Facebook page followed by thousands of workers which shares information about working conditions and helped coordinate the protests. Now the page is helping collect money and launch support actions to demand the reinstatement of K.W. We also know that one comrade is slated for dismissal as well. He was very vocal at the Warsaw protest, which he played an active part in organizing. Now he is on sick leave and cannot be fired until he returns or until a certain period lapses. We are also preparing solidarity with him and protests to demand he and others are not repressed. Another comrade reported that he is now being „controlled” at work and, as we understand, this can be a way to set him up and create some ficticious infractions. 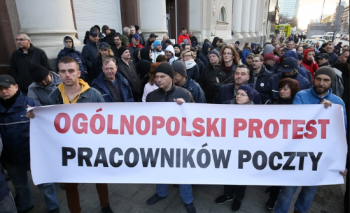 The next step is another national meeting over the weekend to react to the repression and coordinate the next actions, which will include a national protest in Warsaw and further escalation. The Post Office and unions seem to be stunned at the scale of the protests, which came off well, despite their considerable attempts at intimidation. The government also tried to undermine them, banning it as a topic in the national state media. However, it was still widely covered and some journalists were shocked to learn of the conditions. As a result, they had to employ a lot of PR to pretend they are doing everything to raise wages and even presenting information about the past „raises”. Workers explained how this works and that the received less money than before. However, the Post Office now has stepped up the whitewashing campaign. This may fool some of the public, but not the workers.